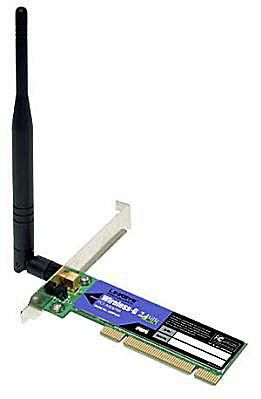 Linksys WMP54G PCI Wireless Network Adapter. Peripheral Component Interconnect (PCI), also called conventional PCI, is an industry specification created in 1992 for connecting local peripheral hardware to a computer's central processing system. PCI defines the electrical characteristics and signal protocols used for devices to communicate over a computer's central bus. PCI was traditionally used as the computer bus interface for network adapters add-in cards including both Ethernet and Wi-Fi adapters for desktop PCs. Consumers could buy desktop PCs with these cards pre-installed or also buy and plug in their own cards separately as needed. ​In addition, PCI technology was also incorporated into standards for laptop computers. CardBus is a PC Card (sometimes called PCMCIA) form factor for connecting thin, credit-card-like external adapters onto a PCI bus. These CardBus adapters plugged into one or two open slots typically located on the side of a laptop computer. CardBus adapters for both Wi-Fi and Ethernet were common until the network hardware evolved sufficiently to be integrated directly onto laptop motherboards. PCI also supported internal adapters for laptop computer designs via the Mini PCI standard. The PCI standard was last updated in 2004 to PCI version 3.0. It has largely been supplanted by PCI Express. PCI Express network adapters supporting current generations of Wi-Fi (both 802.11n and 802.11ac) are produced by several manufacturers, as are those for Gigabit Ethernet. PCIe is also commonly used by storage and video adapters. Add-in cards may not work or they may behave in unpredictable ways if not firmly inserted (seated) into the physical PCI/PCIe slot. On computers with multiple card slots, it's possible for one slot to fail electrically while others continue working correctly. A common troubleshooting technique when working with these cards is to test them in different PCI/PCIe slots to pinpoint any issues. PCI/PCIe cards can fail due to overheating (more common in the case of CardBus) or due to worn electrical contacts after large numbers of insertions and removals. PCI/PCIe cards generally do not have swappable components and are intended to be replaced rather than repaired.